The world’s largest combined inventory of authentic Native American turquoise jewelry is only available at Palms Trading Company. This elegant stone is magnificently featured in several our necklaces, rings, bracelets and earrings. Discover the splendor of natural turquoise gemstones featured in our handcrafted Native American Indian jewelry. 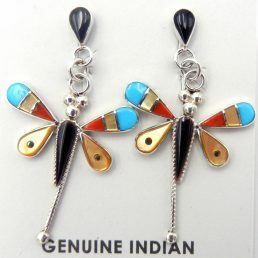 Turquoise is the most common gemstone used in Southwestern Indian jewelry. Naturally occurring in a variety of blue, yellow, green and brown hues, this stone is renowned for its innate beauty. This softer, porous gem is characterized by its opaque and waxy sheen. Over time, these stones will change color as they are exposed to body oils and environmental elements. 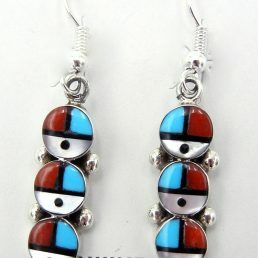 When purchasing authentic Native American turquoise jewelry, it’s important to know if the stone has been treated. While a lacquering application may increase the stone’s hardness, other treatment processes can gradually wear off. Knowing how your turquoise was treated will help keep your jewelry in excellent condition. 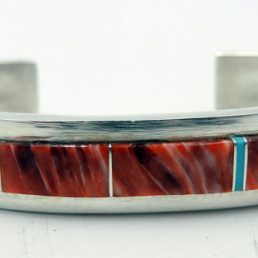 Jewelry featuring the turquoise stone can be found across a few Native American tribes and Pueblos of the Southwest, most notably the Zuni and Navajo. 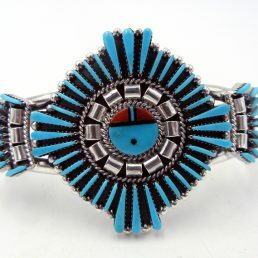 The Zuni traditionally use sky blue Sleeping Beauty gemstones. Their needlepoint designs arrange small pieces of the uniform stone in detailed patterns. 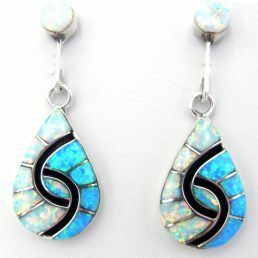 The Navajo, however, use chunky turquoise gems that display the various naturally occurring color matrices. 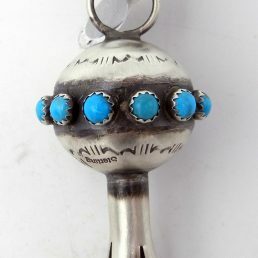 Their intricate shank designs and detailed stamping techniques perfectly accent the beautiful blend of sterling silver and turquoise gems. 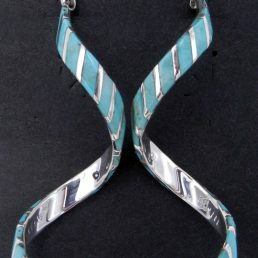 Other artists, like those from the Santo Domingo Pueblo, also utilize turquoise stones in their jewelry. 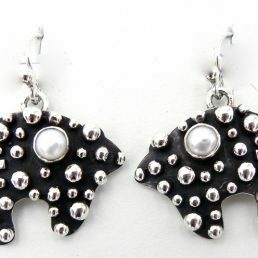 Their heishi jewelry often features small turquoise slabs or beads. The unparalleled collection of jewelry, pottery and art available at Palms Trading Company is exclusive to the Southwest. 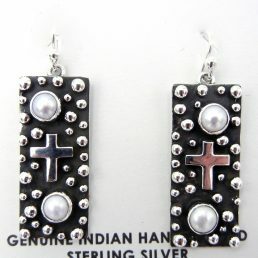 The rich history, cultures and customs of our region’s Native American heritage is inherent in every handcrafted piece. 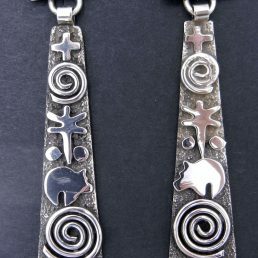 With a selection of authentic Native American turquoise jewelry you won’t find anywhere else, Palms Trading Company is your destination for genuine Indian collectibles.